Providing straw is a well-known obstacle for use on slatted floors because as the straw may rapidly get out of reach of the pigs by falling through the slats and because the straw may block the liquid manure handling system. Research in Sweden investigates the throughput capacity of straw for nestbuilding in farrowing sows and for reducing tail biting in weaned and growing-fattening pigs. 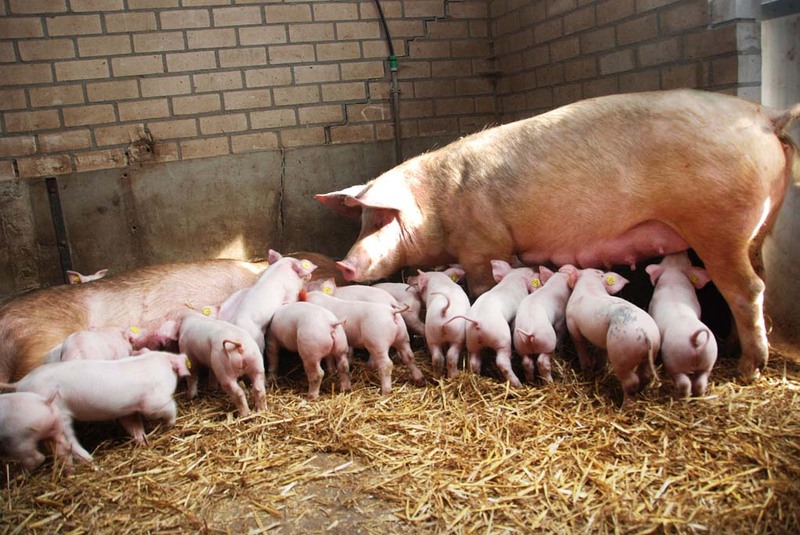 Nest-building behaviour is regarded as a behavioural need for the pre-partum sow and sows in modern pig husbandry are highly motivated to perform this behaviour. A sow that lacks possibilities to perform foraging and nest-building behaviour at farrowing will be frustrated and stressed, which can result in reduced piglet survival or savaging of piglets. Thus, sows should be provided with appropriate substrate to perform nest-building behaviour at farrowing. Furthermore, many newborn piglets in modern pig production develop lameness and poor claw health due to poor floor quality. 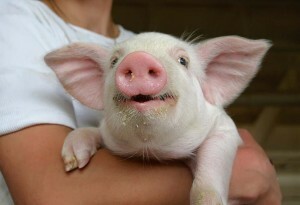 Lame piglets often need medical treatment and have a reduced growth rate. The claws of newborn piglets have an extremely soft horn tissue making them vulnerable to bruising in early life. However, a few days after birth, the horn tissue becomes harder and more resistant to injury. Provision of straw as bedding only during the first week of life might therefore be sufficient to reduce the incidence of lesions. Straw bedding is also a source of thermal insulation, found to be suitable for the prevention of prolonged hypothermia in newborn pigs. Piglets with a low body temperature are more likely to die from infections or crushing. 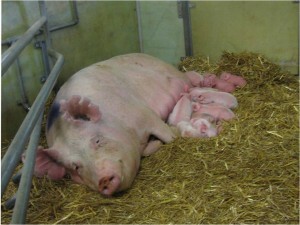 Provision of straw to newborn piglets may increase their welfare by decreasing the risk of lameness and/or hypothermia. In a Swedish study a strategic usage of straw was investigate in two commercial piglet producing farms. The ability of straw to drain through slatted flooring was studied giving the sows 15 kg of chopped straw around the time of farrowing. In total 96 sows were studied and all sows were loose housed in partly slatted farrowing pens (plastic or cast-iron slats). Chopped wheat straw of three different lengths was compared. The mass median straw lengths were 39, 70 and 130 mm, respectively. 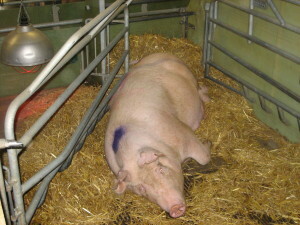 It was found that by Day 4 after farrowing straw with short and medium chop length was completely absent in 83% (plastic slats) and 85% (cast-iron slats) of the pens. However, at Day 4 straw was absent in only 6-7% of the pens provided with the longest straw category. The conclusion from the study is that it is technically feasible to maintain good pen hygiene in partly slatted farrowing pens, even if the sows are provided with 15 kg of chopped straw at farrowing. However, straw chop lengths need to be adjusted to the type of slatted flooring used. When these results are applied to the objective of using straw as enrichment for growing pigs and to counteract tail biting, the paper shows that it is possible to use straw cleverly and adapt the straw structure to the slatted floor. Optimal is that we give the pigs straw of a structure that enhances their litter related behaviours, but at the same time remains manageable for the farmer and the manure system. This study shows that chopped wheat straw of mass median lengths between 39 and 70 mm can be managed in a slatted system. The paper also evokes the thought that the amount of straw could be varied according to the behavioral needs of the growing pigs, e.g. more straw could be provided to the pigs when they are put into to a new compartment after weaning. Ideally, it could also be possible to develop a monitoring system of early warning of impending tail-biting outbreaks and then increase the amount of straw given to the pigs to counteract (and hence prevent) the outbreak. This could be partly automatic (precision livestock farming). * To what extent was the straw remaining available to the pigs, e.g. what % is lost through the slats and for how long is it visible in the pen? The straw (15 kg) was given 2 days prior to expected farrowing and the remains were scored 6 days later (i.e. four days after farrowing). Plastic slats dimensions were: slat width 15 mm, opening width 10 mm, opening length 36 and 84 mm. Cast iron slats: slat width 11mm, opening width 11 mm and opening length 200 mm. In plastic-slatted pens (i.e. on Farm A), bedding was completely absent (0 kg) on Day 4 in 25 of 30 pens (83%) when provided with straw of short or medium chop lengths compared to 1 of 15 pens (7%) provided with long straw. Similar figures were seen on Farm B which had cast-iron slatted pens, where bedding was absent in 22 of 26 short/medium straw pens (85%) and 1 of 17 long straw pens (6%), respectively. On Day 4 after farrowing, 37 of 43 cast-iron pens (86%) were completely dry and clean on the solid floor. This was the same for the plastic-slatted pens provided with bedding of short or medium straw. However, in plastic-slatted pens provided with bedding of long straw, hygiene became worse over time. * To what extent did the manure system get blocked, both in the short term and long term? It was never blocked as the sow and the piglets were degrading the straw over time. In this case 15 kg was given once to the sows for the 6 days. After that, from Day 4 after farrowing and onwards, a small amount of chopped straw (~0.5 kg) was given daily according to the farms’ regular management practice. Weaning was performed after 5 weeks. For the total suckling period it was ~35 kg of straw used. * What remains to be done in the FareWellDock project? We will investigate the straw amount and the length that could be used to find an optimum level for usage in semi-slatted pens for growing-fattening pigs. The optimum is where enough straw is provided to minimise the risk of tail and ear biting, while pen hygiene and manure system continue to function at acceptable levels to the farmer. We will start with a survey in Sweden to investigate this further. Westin, R., Holmgren, N., Hultgren, J. and B. Algers, 2014. Large quantities of straw at farrowing prevents bruising and increases weight gain in piglets. Preventive Veterinary Medicine 115: 181-190. doi: http://dx.doi.org/10.1016/j.prevetmed.2014.04.004. Westin, R. 2014. 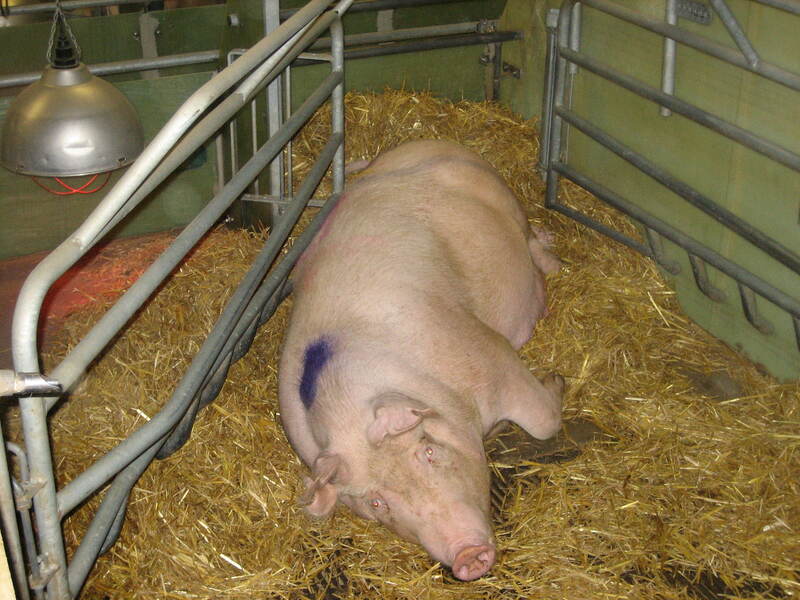 Strategic Use of Straw at Farrowing – Effects on Behaviour, Health and Production in Sows and Piglets. PhD thesis, SLU, Skara. •Strategic use of large quantities of straw effectively prevents piglets from developing skin abrasions and claw lesions. •The overall prevalence of skin and claw lesions was reduced by at least 50% in STRAW compared to CONTROL piglets. •Average daily weight gain until 5 days of age increased by 25 g in the STRAW treatment. Firstly, research has been commissioned on tail biting and tail docking in pigs (2013-2017). Secondly, steps have been taken to reduce tail docking in practice (Van Dekken, 28286, nr. 666). The House of Parliament has asked the government to negotiate an end date for tail docking together with the stakeholders who signed the Declaration Dalfsen. Since early 2013 the European Commission is working on a plan to address routine docking of piglets at the European level. In parallel, the Dutch pig sector organisations LTO and NVV, and the Dutch Society for the Protection of Animal together drafted and signed the Declaration of Dalfsen, which was presented on June 10, 2013. The Declaration focuses on the prevention of biting , the gradual reduction of short tail docking, leading finally to the responsible ending of the practice of tail docking . It is a process in which partners have expressed trust in each other. These are important steps in the right direction. The Animal Welfare policy note states that the declaration is endorsed and supported by the funding of research. In about two years this research is likely to provide insight if and which promising solutions exist. At that point in time more will be known about the progress made at the European level. At that time the Secretary of State and the partners of the declaration will determine a realistic deadline to responsibly stop the tail docking of pigs. Finally, as to the strict compliance of the EC Directive on pig welfare in Europe (Ouwehand, TK 21501-32, nr. 750): The House of Parliament has asked the government insist that the European Commission will move towards strict enforcement of animal welfare guidelines and reports on compliance in the Member States. This is related to signs of non-compliance of the Directive by several Member States and more specifically in the areas of tail docking and the routing filing of canine teeth. With a view to improving the implementation and enforcement of the Directive lying down minimum standards for the protection of pigs (2008/120/EC), the Commission – partly based on the Dutch request – started the development of guidelines supplementing the Directive, including a guideline on tail docking. These guidelines (which are expected to be completed this year) are expected to improve enforcement and compliance. The second meeting of the FareWellDock project was held on Thursday March 27 2014 by videoconference. Partners from Finland, the UK, Denmark, France, the Netherlands, Sweden and Norway presented their work in progress. All partners have started and work is on schedule. We now have a new logo and several abstracts have already been submitted for presentation at scientific conferences (DK on pain in docking at ISAE 2014; FI on tear staining at WAFL and NL on logging AMI (animal-material interactions) at Measuring Behavior 2013). Prof. Valros gave an interview to a Dutch Journalist for the farmer Magazine ‘Varkens’ about the Finnish pig sector and the recent publication showing that chewable enrichment materials in the farrowing pen can reduce tail biting in later life (Telkänrantaa et al. 2014). Another farm magazine article about the startup of the FareWellDock project is expected in the Finnish journal KMVET. Our next meeting is scheduled for Thursday October 9, 2014.